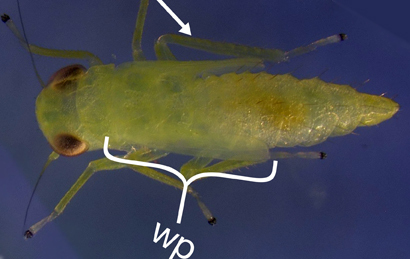 Late-instar potato leafhopper with wing pads and specialized legs used for jumping. A new, open-access article in the Journal of Integrated Pest Management summarizes the knowledge to date on the biology of the potato leafhopper, Empoasca fabae (Harris), including its distribution, development, migration, agricultural host plants, and mechanics of injury to host plants, especially alfalfa. Native to North America, the potato leafhopper migrates northward from the Gulf States each summer to the Midwest and eastern United States, where it is a key agricultural pest in many crops. As the key economic pest of alfalfa in the North Central and Northeast United States, yield losses have been documented up to $66/ha (or $27/acre). In this pest profile, the authors summarize knowledge potato leafhopper life history, ecology, scouting procedures, and management options. Click here for the open-access JIPM article.